We are living the future now with things like Renewable Energy, Self Driving Cars, Artificial Intelligence and…… machines that can automatically throw a ball for your dog. Yes, that really is a thing. If you want to know more about automatic ball throwers for dogs then this guide is going to explain everything and you will be able to find the best option by the time you have finished reading the individual reviews. 6.3 Are they worth buying? 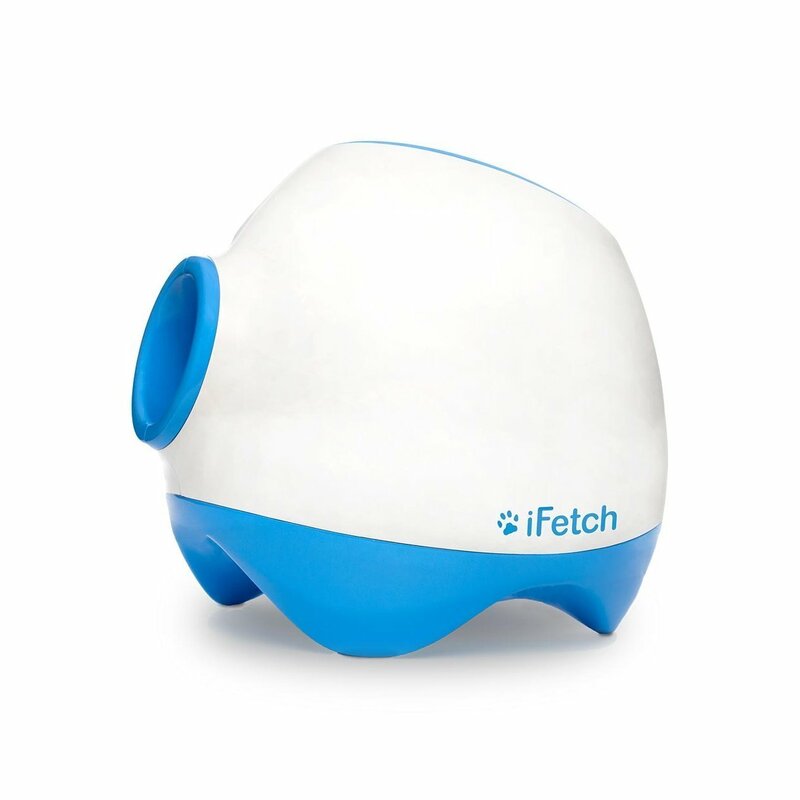 The iFetch device was actually launched back in 2014 but currently even after all that time it is still the number 1 choice for many people including myself. It comes with 3 launch settings so you can choose the perfect distance for the size of your yard so that is something you don’t have to worry about, if there is room for your dog to run a round then this will work fine. If you don’t have yard and live in an apartment then this something you can still use by putting it on the lowest setting. The iFetch device works by playing a high pitched tone only your dog can hear which only your dog can hear and then it proceeds to launch the ball. Once your dog places the ball back in the device much like the the others then repeats the process. It may seem like this will be hard for your dog to figure out but I was actually very surprised at how fast my dog figured out how to use the device and I think you will too! One important thing to note is that this machine 11 inches long and 8 inches wide and the balls it launches are very small. If you have a larger sized dog then you should really get the iFetch too as it is possible that your dog could choke on the smaller sized balls. This iFetch devices uses c-batteries which can make this last up to 60 days before you need to replace them. This device is obviously quite similar to the original iFetch but is priced slight higher and for that you get some upgraded features. For starters this device can launch balls up to 40 meters in length making it one of the best for distance. This device is 14 inches long and 13 inches wide but most importantly it allows bigger sized balls to be used which makes this the better device for larger sized dogs by getting ride of the the choking hazard. Another good feature with the iFetch Too is that it is actually rechargeable which in the long run should save you time and money since you won’t have to replace the batteries. The iFetch too is a good strong well built product and is similar to original iFetch in every other way bar the power. If you like the sound of the iFetch reviews then get this product if you have dog similar in size to say a golden retriever. 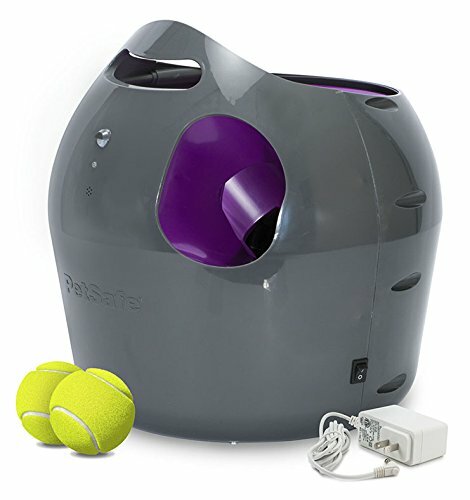 If you have read my wireless fence review then you will know that PetSafe were the leaders when it came to that product. What about for ball launchers though? To start with I would say that their ball launcher is definitely quite expensive but offers way more options compared to the iFetch products. The Petsafe launcher comes with 9 different distance options allowing you to launch it as far as 9 meters and as little as 2.5 . The first special feature with the Petsafe launcher is that as well as the distance settings it also has angle settings so because of that this really is the perfect device for people who want an indoor launcher. Don’t put off though if you want to use it outside as this works great in a back yard as well. The second amazing feature is the motion sensor on the launcher, this makes sure that your dog and other humans around the launcher don’t get injured from balls accidentally launched. It also makes sure that when you dog wants to rest it will go into sleep mode and save your battery bower or if you are using it inside then you can just the mains power. 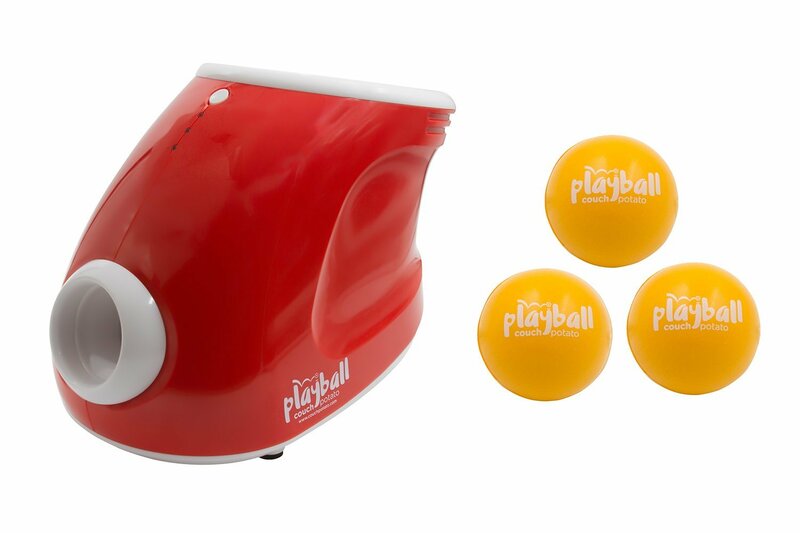 The Playball Couch Potato reminds me a lot of the iFetch almost to the point of a rip off but this is actually a lot cheaper. It comes with 3 distance settings and 3 balls that are saliva resident which sounds good but they are actually quite low in quality and it was very easy for my dog to chew them and destroy them which is a shame as the device only takes balls these size. This Playball launcher is not rechargeable and but requires 6 C batteries which (no surprise) are not included when buy this. If you want to use this inside then you also have the option to plug it into the mains which is useful. This is good cheap ball launcher that does the same jobs as the more expensive ones but be careful as if you are too heavy handed you might just end up breaking it on the first day. Also make sure that you only buy this for small dogs as the balls are very small and larger dogs could end up choking. Finally we have the iDogMate which at first glance looks like it might be another copy of the iFetch launcher but upon closer inspection I can see that this device is way more high tech and is almost a little bit overkill actually. For starters this launcher isn’t engineered in a place like China but instead in boasts German engineering and comes with a remote control. It has 4 different distance settings starting at 10 feet and going up to 50 feet. It comes with rechargeable batteries and one full charge can get you up to over 1500 ball throws which is more than enough for any one dog. My favorite feature with the iDogMate is how easy they have made it for the dog to get used to this device. 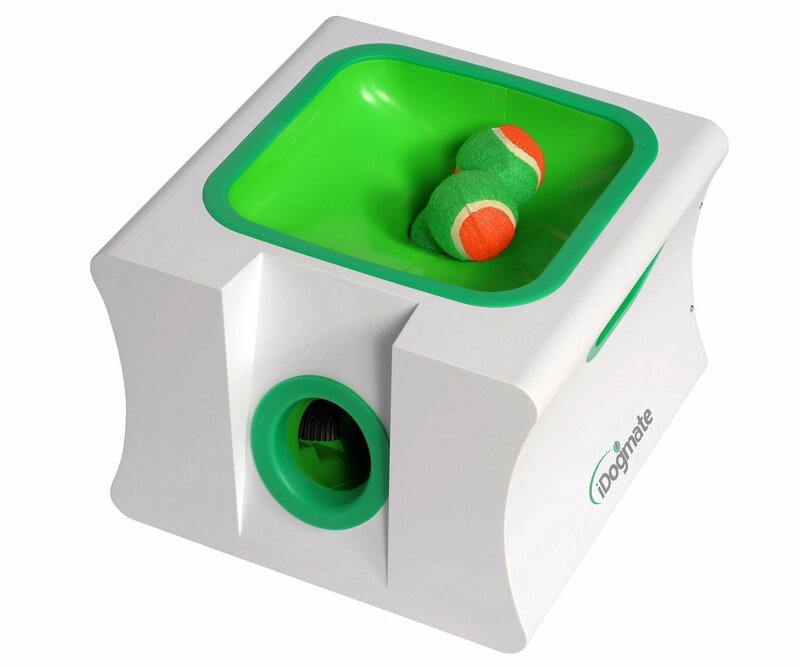 Inside of a small hole for your dog to try and place the ball in it offers a wide area that can receive multiple balls at the same time which makes it really easy for dog to use this. Not a lot of people know these exist but for the special few it’s a trend that is continuing to grow and for good reason. On the surface to some people it may seem like this is just something that will be used by lazy neglectful dog owners. If you put all pre-conceptions aside though we can see that it is actually a very useful device that could be used by elderly dog owners or those with a disability. The great thing is that most dogs including mine absolutely love using these kinds of machines and once they train themselves to use the launchers return the ball the machine their day to day life’s become way more fun as they can play endlessely which is a great thing for any dog. These machines are battery powered and usually water resistant so you can pretty much just turn it on and leave it outside for the whole day and just replace the battery whenever it starts to run low. The main problem with buying automatic ball launchers online is that the cheaper ones usually tend to be out of stock due their growing popularity. If you see one available you really should seize on the opportunity get yourself a good deal. If you are willing the pay a slightly higher price for the iFetch for example then then you shouldn’t have any problems trying to get one delivered and you can expect to get a longer lasting more high quality built launcher that also has better reviews. These are really cool gadgets and your dog is pretty much guaranteed to have hours of fun, my dog gets really excited whenever I pull out my iFetch launcher and I am sure your dog will as well. Hi Jackie, Honestly.. your best bet would be over on Amazon.